Whether you are an admirer of 7 or 8 inch tablet devices, or don't really care about these particular screen sizes, the leading mobile gear makers decided that there is a market niche to be won here, and with the introduction of the Samsung Galaxy Note 8.0 everyone will have a dog in the small tablet fight this season. We are pitting Samsung's latest Note family member against its most formidable opponents - the Apple iPad mini and the Google Nexus 7 small affordable slates. While we don't have much details on price and availability for the Note 8.0 rather than Q2 in Europe and Asia, the other two have been around for a while, so you can have a look how they stack up in the table below. It's immediately clear that Samsung has placed a lot of effort to make its tablet as slim and light as possible, considering that it also has to house the S Pen silo and the stylus itself. The Note 8.0 is in fact slimmer and a tad lighter than the Nexus 7, despite being the slate with the largest screen of the bunch. Its resolution is actually the same as that of the Nexus 7, with a slightly lower pixel density because of the screen size. Note 8.0 also has the immediately recognizable styling of the Galaxy family with its rounded corners, looking like a larger Note II. As far as processing power goes, the 1.6 GHz Exynos 4 Quad Cortex-A9 CPU might not be at the fastest edge of ARM's technology, but it would surely be more than enough to handle anything Android throws at it. Moreover, Samsung's tablet is the best of the bunch memorywise, sporting 2 GB of RAM and 16 GB of internal memory, as well as a microSD slot for more, which the other two don't have. When we add the generous 4, 600 mAh battery and the myriad of productivity options added by the S Pen stylus and the accompanying software, it seems that Samsung has nailed it in terms of specs as usual, so the only thing remaining is to get one for a review to check out the performance side as well. looks super duper ugly!! remove that freaking bezel!!! oh what am i saying, its samsung after all! Those bezels are not as thick as Nexus 7 and you can do probably 20 times more on Note 8.0 what you can do on Nexus 7 and iPad. It is way better looking device with ultimate features. Way to go Sammy. I wouldn't call A9 processor and low pixel density "ultimate features". It's actually a quite modest tablet which shows that Samsung are starting doing an Apple and getting comfortable with the sales. Even I was a bit skeptical of the bazel at first but the more I look at it the more I like it! and it has the phone functionality which I am guessing is integrated into the S-Pen....sammy nailed it once again! im sick of the rounded corners too. The IPad looks cutest but I prefer Nexus in terms of both design and functionality. The 4.72" width seems fit, 5.3" is probaly too large and cause tension on fingers holding it for long. i have owned Note, Note 2 and Note 10.1 and as a matter of fact just sold my Note 10.1 2days ago. im a sammy boy. TBH Note series of devices are not for everyone!these devices are more targeted to the professional people who need a device to draw on.but i can tell u one thing for sure, Note series of devices are THE BEST u can get on market in terms of sheer performance! 10.1 is the fastest android tablet (yeah it beats Nexus 10!) Note 2 is the best Phone but these are not good in terms of build quality. 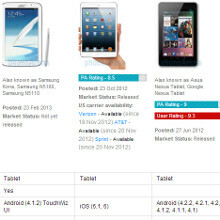 u compare Note 2 to S3, its worse than S3 in build, u compare Note 10.1 to Nexus 10 its s**t! so if u want Mere Performance with almost NO LAG, go for Note devices! yeah except your maths is s**t. 3x1 and 2x2 are not the same area.. So you are comparing 3:1 ratio with 4:3. Who uses 3:1 displays?! The fact that the iPad uses such a BS ratio makes the screen area smaller when watching videos, making for screen of less then 8". Oh Wendy for heaven sake just shut the f**k up please. And the winner is still undisputed champion. NEXUS 7! Can't wait to see the new 2013 Nexus 7 vs Samsung vs IPad vs window. Like you, I'm giving the win to the Nexus family... they update 5x faster then the Galaxy family. Right now SGN-2 is on 4.1.2, Note -10.1 is on the same version, thanks to XDA! Note 10.1 is on 4.1.2 , updated mine yesterday via Kies, not available OTA yet, (UK). Windows RT is a pathetic excuse for a tablet...as far as I am concernced. That's true, but they need to hit it out the park with the next line of iPads or the gap will shrink. U.r. absolutely right, Next Gen. IPad5 should astonish customers who are hesitated right now trying to get away from iPad heading to surface or Nexus. Apple must defend iPad better than they did to iPhone which is not Ok right now!!! If priced well this is my next tablet... Will sell my nexus 7 for it... With Samsung features such as multi windows this will be awesome and with a quad core exynos and 2gb ram it should be awesome..